This nursing bra is a fantastic option for women with smaller breasts looking for a leisure nursing bra style. The "Original" isn't size-specific, but it is a great style for fluctuation and for when your breasts become engorged. I love this style because of the trendy sporty styling and high level of comfort. The material is buttery soft and feels amazing. It has great stretch in the cups for nursing mothers and has a racerback for additional support. 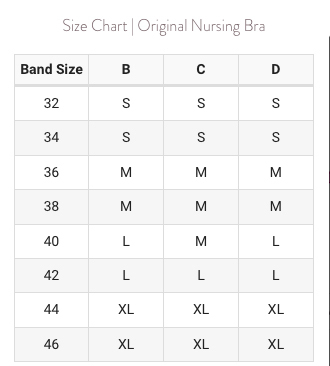 This bra can be converted to a leisure bra after nursing by switching out the nursing clips for the included bra converters. The Original Nursing Bra is a modern take on a classic Bravado Designs style for pregnant women and nursing moms. Its every moms everyday must-have, whether in her hospital bag, at home or on-the-go. Theres something about the cozy comfort of cotton (and ultra-soft modal) in our heritage style that moms have loved since our beginning. We know you will, too! Manufacturer Recommended Washing Instructions: Hand wash cold. Wash with like colors. Wash before wearing. Non-chlorine bleach when needed. Hang to dry. Do not iron. Do not dry clean.